Update: Check out the new construction on the hotel! In my continuing search for new and interesting articles due directly to my incredible fascination with North Korea (Democratic Peoples Republic of Korea), I recently found an article in Esquire about the monstrous Ryugyong Hotel, a vacant skyscraper hotel that was originally meant to be a shining symbol of the prosperity of the DPRK but has sat empty and incomplete since construction ceased in 1992 (construction began in 1987). The Ryugyong Hotel (Korean: 류경호텔)(or Ryu-Gyong Hotel or Yu-Kyung Hotel) is an unfinished concrete skyscraper. It is intended for use as a hotel in Sojang-dong, in the Potong-gang District of Pyongyang, North Korea. The hotel’s name comes from one of the historic names for Pyongyang: Ryugyong, or “capital of willows.” Its 105 stories rise to a height of 330 m (1,083 ft), and it contains 360,000 m² (3.9 million square feet) of floor space, making it the most prominent feature of the city’s skyline and by far the largest structure in the country. At one time, it would have been the world’s tallest hotel. Esquire dubbed it “The Worst Building in the History of Mankind” and noted that the government of North Korea has airbrushed the building out of pictures. The Christian Science Monitor called it “one of the most expensive white elephants in history”. Over the years, the skyscraper has earned such nicknames as the “Hotel of Doom,” “Phantom Hotel,” and “Phantom Pyramid.” Construction began in 1987 and ceased in 1992, due to the government’s financial difficulties. The unfinished hotel remained untouched until April 2008, when construction resumed after being inactive 16 years. A picture doesn’t lie — the one-hundred-and-five-story Ryugyong Hotel is hideous, dominating the Pyongyang skyline like some twisted North Korean version of Cinderella’s castle. Not that you would be able to tell from the official government photos of the North Korean capital — the hotel is such an eyesore, the Communist regime routinely covers it up, airbrushing it to make it look like it’s open — or Photoshopping or cropping it out of pictures completely. Even by Communist standards, the 3,000-room hotel is hideously ugly, a series of three gray 328-foot long concrete wings shaped into a steep pyramid. With 75 degree sides that rise to an apex of 1,083 feet, the Hotel of Doom (also known as the Phantom Hotel and the Phantom Pyramid) isn’t the just the worst designed building in the world — it’s the worst-built building, too. In 1987, Baikdoosan Architects and Engineers put its first shovel into the ground and more than twenty years later, after North Korea poured more than two percent of its gross domestic product to building this monster, the hotel remains unoccupied, unopened, and unfinished. But, since the Esquire article was posted, there has actually been construction activity, for the first time in 16 years! SHENYANG, China, May 19 (Yonhap) — North Korea resumed the construction of a highrise hotel building in Pyongyang last month, which was suspended for nearly 20 years due to funding problems, informed sources here said Monday. 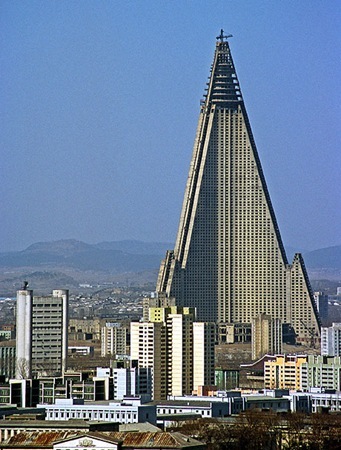 The construction of the luxury Ryugyong Hotel began in 1987 with French capital and technology for completion in 1992. The 105-story building has long been left uncompleted since early 1990s amid North Korea’s chronic economic problems. “North Korean authorities restarted the construction of Ryugyong Hotel in April,” the sources said, quoting those who recently returned from trips to Pyongyang. Orascom Telecom Holding of Egypt is North Korea’s partner for the construction, the sources said. “If completed, the hotel will be used as an accommodation for foreign investors and visitors, a business center and an international convention center among others,” a source said. The 330-meter hotel is expected to be the world’s tallest when completed. Traders in Shenyang, China with ties to Pyongyang say the North has now found that funding, partnering with Egypt’s Orascom Group. Orascom has publicized significant investment plans for North Korea in the last twelve months. Orascom Telecom Holding announced on January 30 of this year that it had been granted the first-ever commercial license to provide WCDMA 3G technology-based cellular service to North Korea, and put forth plans to invest 400 million USD to create a nationwide infrastructure. This deal followed on the heals of Orascom’s first venture into DPRK investment, announced in mid July, 2007, when Orascom Construction Industries purchased a 50 percent stake in the North’s Sangwon Cement Factory near Pyongyang. This venture involved the injection of 115 million USD, which is being used to modernize the facility and increase production capacity from 2.5 million tons to 3 million tons per year. …which is another odd move, considering that citizens in the DPRK are not allowed to own cellular phones. Or maybe they will be allowed to? Earlier this year, the company said that it expects to sign up an initial 100,000 subscribers when it launches its new GSM network in North Korea. Speaking on a conference call, CEO Naguib Sawiris said that the service would start in three main cities in the country and the company will then pause to assess the impact. The company aims to spend an initial US$200 million on the network over the next twelve months, with US$100 per year for the two years after that. I was interested that the Ryugyong hotel began to be built with French capital… I sort of remembered it when I found the above linked article and your blog confirmed it! I was there in October, and a few sheets of reflective glass had been put up, one one side, fairly high up on the building. You could see it would look a lot better that way, but still totally out of place since there are no other modern-looking or glass-sided buidings there, and everything else looks a lot like Beijing 40 years ago.